Welcome to Part 3 of our digital journey through Italy! 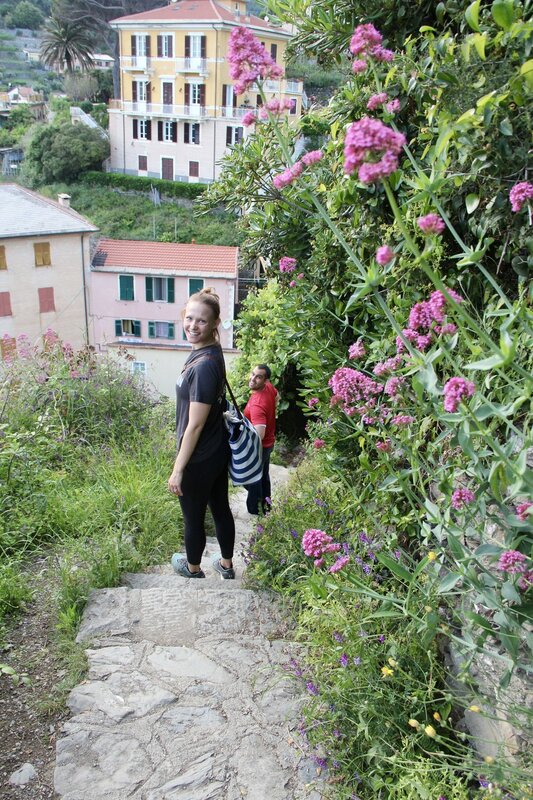 This post will focus on our one-night stay in Cinque Terre. 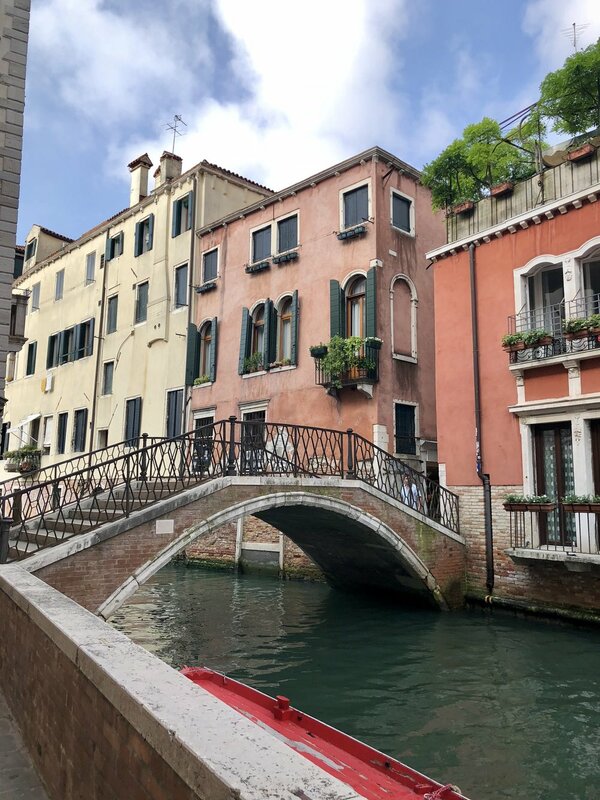 If you’re planning your own trip, be sure to check out my family’s Venice itinerary, Duomo experience, and Florence tips. A guide for Tuscany and Rome will be published soon. This picturesque portion of Italy is comprised of five villages on the Italian Riviera: Monterosso al Mare, Vernazza, Corniglia, Manarola, and Riomaggiore. Paths connect these villages, and one of the prime attractions of this region is hiking between the quaint and colorful towns. While once an isolated area that was difficult to access via most forms of transportation, trains now connect the villages to each other and to more central locations. Cinque Terre, which literally means “Five Lands,” didn’t become a popular tourism spot until the 1970s and has since been dubbed a UNESCO World Heritage Site and national park. My family opted to hop a train from Florence to the largest of these villages, Monterosso al Mare, where we spent one night at La Cabana Hotel before heading to Rome. The quaint, family-run inn has gorgeous views of the Mediterranean, and the room price includes a sizable breakfast. My husband and I splurged on one of the “Junior Suites,” which included a terrace and hot tub. We liked the idea of having a place where the family could relax together. Monterosso also doesn’t have the same night life scene as some of the larger cities we were visiting, so the hot tub provided us a fun evening activity. The hotel is situated above the main town and is about a five-minute drive from the train station. Free shuttle service to and from La Cabana are available via the front desk. You should coordinate with the staff before arrival to ensure a smooth check-in process—we had no issues scheduling an early morning car through the hotel. You’re also able to walk down to Monterosso’s main street thanks to a paved path through olive trees, but I wouldn’t recommend it with luggage. The walk takes approximately 10 minutes. 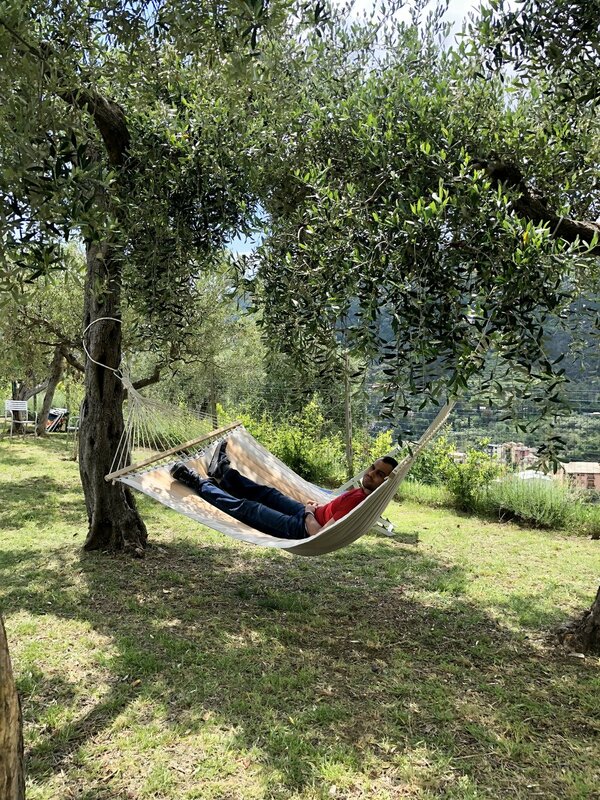 We really enjoyed our stay in Cinque Terre—it was a relaxing portion of our journey placed strategically between the busy days spent in Florence and Rome. While we loved our large and affordable Airbnbs, it was also enjoyable to have a somewhat luxurious night in a proper hotel—we didn’t have to take the trash out or strip the sheets before leaving! The path down from La Cabana to the village. Dad was looking for an “American breakfast” the whole trip—these eggs made him happy! There are ferries and boats galore in Cinque Terre, and if the weather holds, I’d highly recommend seeing the five towns from the water. The Fitzgerald family hired Captain Stefano for a three-hour private boat tour—and it was such a success! Just three sisters, exploring Cinque Terre by boat! After checking into our hotel, we picked up (delicious) pasta to-go and a bottle of wine for our tour. Stefano met us at the main port—his boats always leave from Monterosso, which was the main reason we opted to stay in this village. He doesn’t mind if you bring snacks and beverages on his vessel, though we double-checked with him via email to be polite. The view from the village of Manarola. The cost of our excursion was €100.00 x hour x boat and had to be paid in cash. This was very reasonable when divided between my party of seven (the max for one boat). We left a 20% tip, meaning each of us paid about $50 for a memorable afternoon with a hilarious, Italian captain. Lastly, some of my best pictures from Italy were snapped on the boat! The pastel-painted villages change colors in the setting sun, and the Mediterranean makes for a beautiful backdrop. Stefano explained to us that he has taken thousands of photos of Cinque Terre, but it never feels like quite enough. As mentioned above, the main attraction of Cinque Terre are the hikes between villages. Four of us opted to hike from the neighboring town of Vernazza back to Monterosso. (The other three were dropped off by our boat captain directly to the port of Monterosso.) The Blue Trail hike took us about 1 hour and 45 minutes, and was a little over 2 miles long. 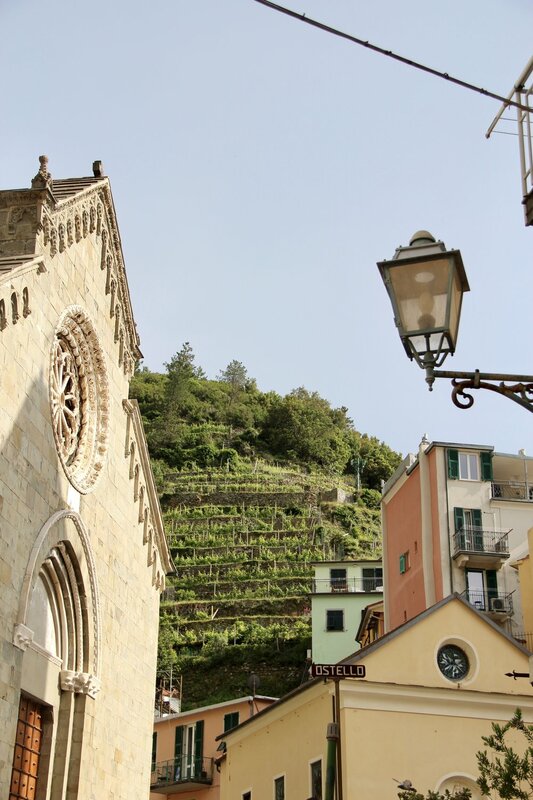 To enter the trail, look for signs to Monterosso and an ascending path along an alley above the church of Saint Margaret of Antioch. You’ll continue to climb up through olive trees and vineyards before the terrain levels out a third of the way through your journey. 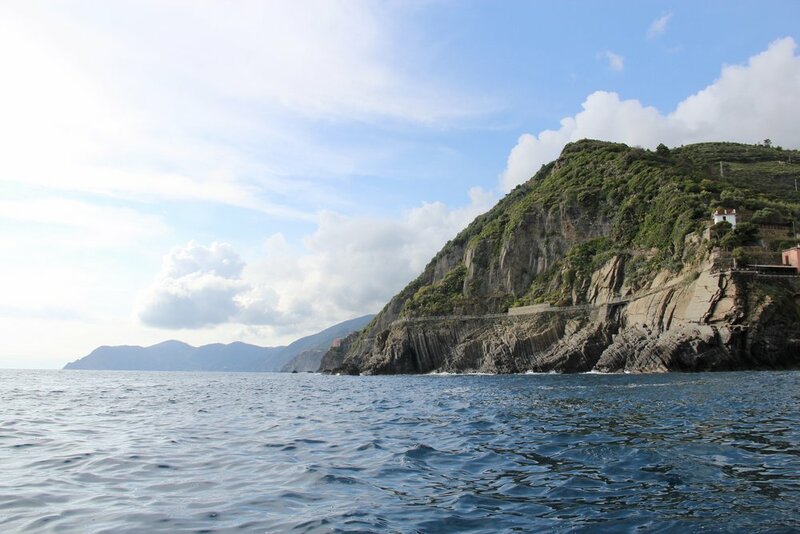 Be sure to turn around and snap a few shots of Vernazza before getting too deep into the forest! The path can be somewhat uneven and a few spots are narrow. 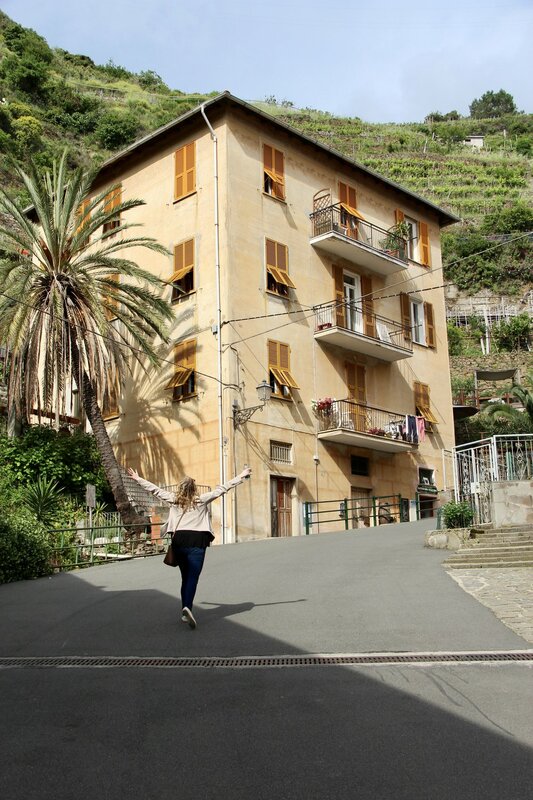 As your hike comes to an end and you begin to descend into town, you’ll see lemon trees and the roofs of Monterosso. Tips: Landslides shuttered some of the trails several years ago, and current weather can close certain paths. Be sure to check the status of your hike before taking off. This website and this website helped keep us up to date. I would also not suggest wearing flip-flops on the trail; I was very comfortable in these lightweight tennis shoes. This is what the terrain of the hike between Vernazza and Monterosso looks like the majority of the time. We didn’t have time to complete the longer hike between Vernazza and Monterosso before sunset (you do not want to be on these old paths at night). But there is another trail option that will take you past two sanctuaries toward the top of the park. This hike is supposed to be around 3 hours and 30 minutes. Looking for a historical spot to visit while in the town of Vernazza? 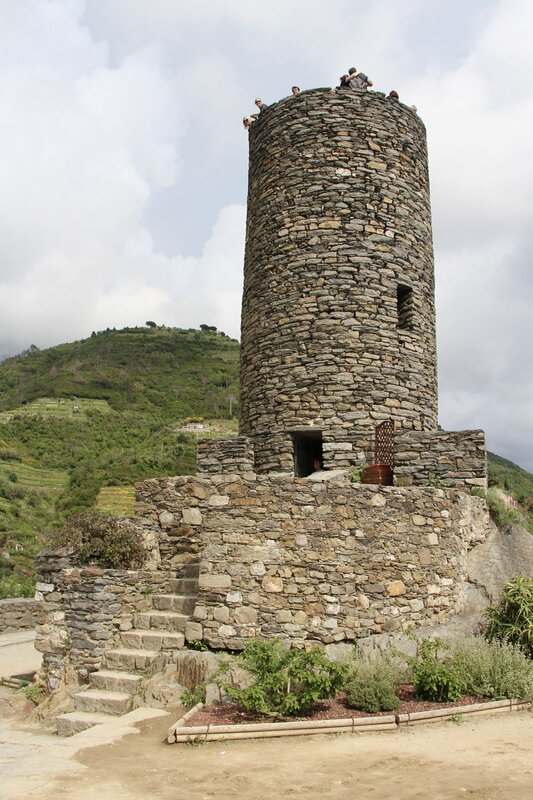 Check out Castello Doria, the oldest surviving tower in Cinque Terre. It dates back to about the year 1000, and it offers up a beautiful 360-degree view of this Mediterranean village. 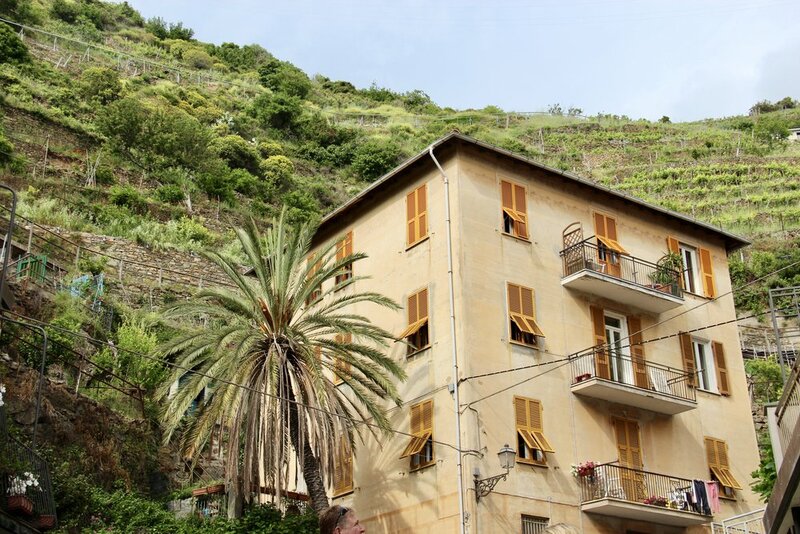 The short but steep hike to Castello Doria will take you through winding paths of quaint, old houses. Once at the top, there is a 1.50 Euro entrance fee—be sure to have cash! Take the narrow staircase to the very top of the tower for one of the tallest views in town. Take a pesto-making class—this region is known for this sauce! Don’t let the buffet-style counter and plastic dishes fool you—this place whipped up some of the creamiest pesto pasta I’ve ever eaten! There was no need for more toppings or salt; the regional pesto was perfection and the trofie pasta (a Northern Italy style-pasta that is twisted and made with a little potato) melted in my hungry mouth. We took our lunch to-go, and devoured it on our boat tour of Cinque Terre. After our hike back to Monterosso, we were famished and seeking another regional dish: seafood! So we went to Da Eraldo, and sat outside at a classic, Italian red and white checkered cloth table. We munched on cheese appetizers, sipped white wine, and ordered incredible seafood pasta dishes filled with prawns, squid, mussels, and salty garlic sauce. I also sampled Cinque Terre’s famous sardines, served with hunks of butter, slices of bread, prosciutto, pesto, and olive oil. This was one of our favorite meals of the trip. Pasta to-go from Gastronomia San Martino. Kathryn’s favorite meal in all of Italy, from Da Eraldo. The weather is always changing here. In May, we wore jeans, short sleeves, and rain jackets. As mentioned above, be sure to check which trails are open before starting your hiking journey. Sometimes, when the trails are “closed” it really means the checkpoint isn’t open. Tourist information centers in the towns will have more information. 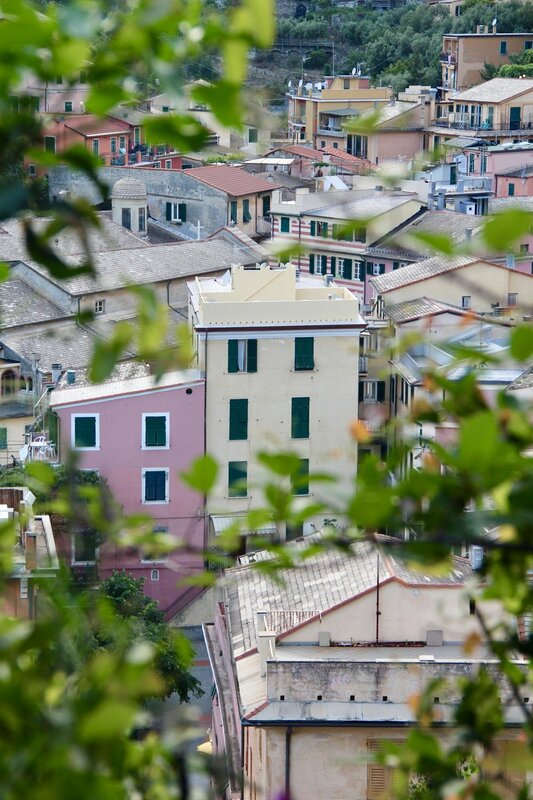 If you plan on hiking multiple trails and using public transportation, look into purchasing the Cinque Terre Card. It was unnecessary for us because we took a boat tour, but it could be useful if that’s not in your budget. I love all of Rick Steves’ guide books—this pocket-sized one is for all of Cinque Terre. And here’s a few more photos from our trip! Welcome to Part 2 of our digital trip through Italy! 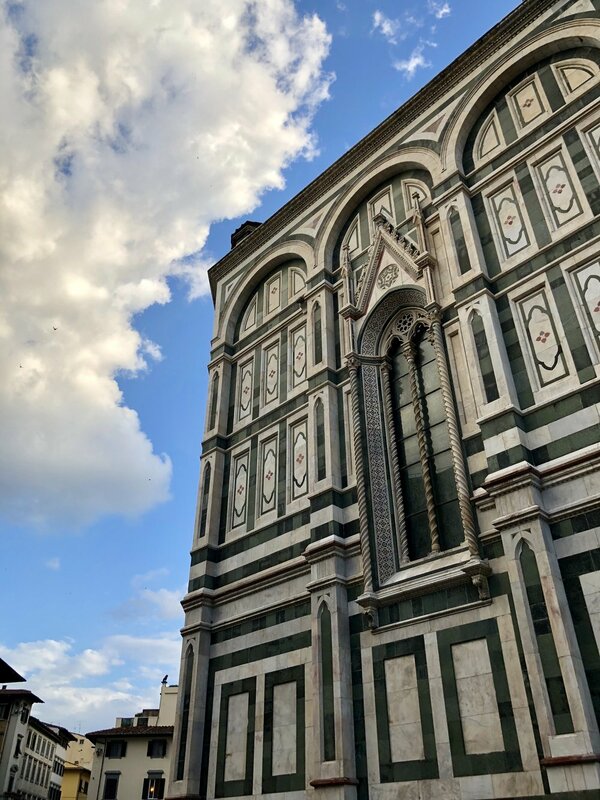 This post will focus on Florence—if you’re planning your own trip, be sure to check out my family’s Venice itinerary and Duomo experience. Guides to Tuscany, Cinque Terre, and Rome will be published soon. I wasn’t sure what I’d think about Rome or Venice, but I knew I’d love Florence before even leaving Brooklyn. A town that birthed the Renaissance and is surrounded by the green hills of Tuscany is all too easy to adore. “Should I look up a Marriott in Florence?” my dad asked from the couch of our Venice apartment. The whole family wore matching expressions of exhaustion and frustration. About two minutes prior, Mom had checked her email for the first time since landing in Italy. It was the end of an eventful day, and we were taking a few minutes to plan the next afternoon’s key swap with the Airbnb host in Florence. But instead of details about how to access the apartment, the host had sent us a long message. The first sentence started with an apology, and then something along the lines of “the apartment you were going to stay in has flooded.” Mom and I both gasped out loud. Luckily, after some frantic Whatsapp messages, we were able to contact the host—he had another apartment for us that would work. My sister Grace would no longer get her own room; instead, she’d have to board with me and my husband. But it was certainly a better option than spending hours looking for an affordable hotel in a foreign city. I’d give our Airbnb mixed reviews: the owner was able to resolve the situation, however, he wasn’t very friendly or helpful. 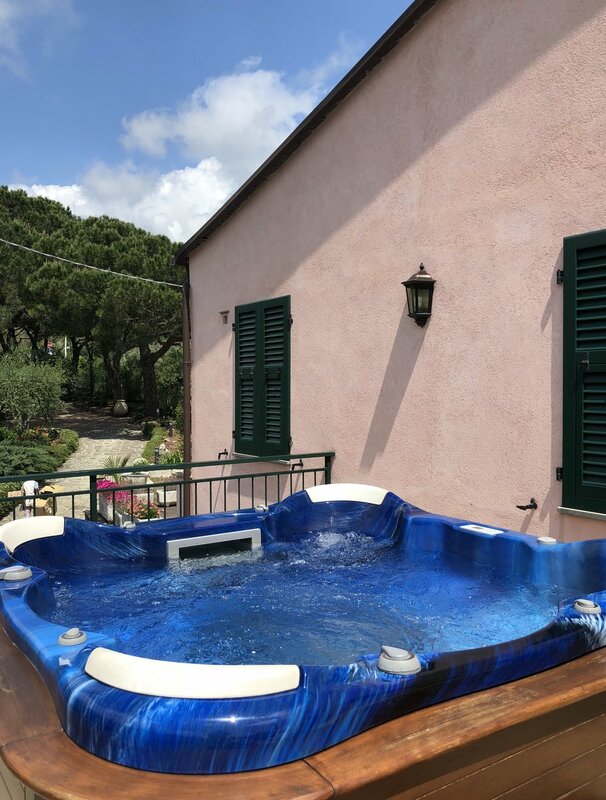 The apartment, located in Piazza dei Ciompi, suited our needs and had a fabulous garden where we drink wine every evening. My husband didn’t enjoy the mattress on our bed, but the AC worked well and the natural sunlight in the back two rooms made for a lovely wake up call. And if you’re traveling with a smaller group, this Airbnb was highly recommended to me. It didn’t work for our numbers—but the view looked incredible. Seeing David in person is vastly different that looking at a picture of Michelangelo’s marble masterpiece. Don’t like museums? This one has about three rooms—you can handle it. Don’t understand the importance? Download Rick Steves' podcast and listen while you walk around the gallery. It’s like having a free, personal tour! Tips: Purchase tickets ahead of time to skip the line. Use this link for the official ticket website. Allow at least 45 minutes to an hour at this museum. Note that it’s closed on Mondays. 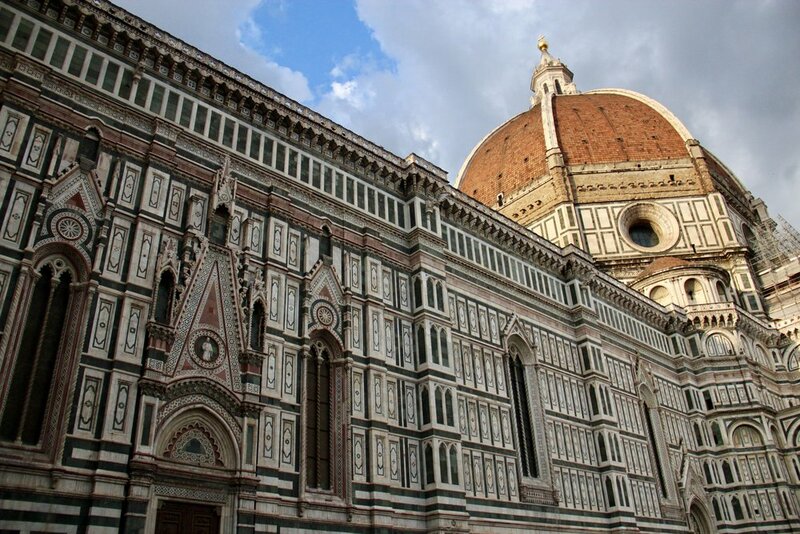 The cathedral, the baptistry, and the climb to the top of this building’s iconic dome were memorable moments of our Florence experience. We ran out of time—but there’s even more to see, including a bell tower and an ancient crypt. For more on our Duomo climbing experience, check out this blog post. Tips: Buy tickets ahead of time to skip some lines. We purchased the 18 Euro passes for access to all the monuments for 72 hours. A separate (free) reservation must be made if you’d like to climb up the dome. This was one of my favorite adventures in Florence. After lunch and a little rainstorm, we walked from the Uffizi Gallery over the Ponte Vecchio Bridge and through the quaint neighborhood of San Niccolò. Our destination was Piazzale Michelangelo, a hill that offers stunning views of Florence. Tips: If you are visiting in spring, don’t go straight to the top! We stopped at a rose garden on the way up to the lookout point. It was nearly deserted and offered beautiful vistas. Once you’ve snapped a few photos, continue your journey to the peak of the hill. Grab a beer, take more pictures, go to the bathroom (for a Euro), and enjoy Florence’s Duomo-dominated skyline. My husband, my brother-in-law, and I stopped into this Renaissance palace that was once owned by the infamous Medici banking family. Built in the mid-1400s, this stone structure holds a wealth of frescoes, tapestries, Venetian chandeliers, and government history—including artifacts, like a bed that Neapolitan slept in! One of its rooms is still used today by state agencies. Tips: It’s worth mentioning that this is one of the only museums open on a Monday in Florence. We arrived around 4pm and experienced no line. Tickets cost 7 Euro. Stop by this large market and food hall to sample everything from buffalo mozzarella to wine. This is one of those places to go if everyone in your group wants to eat something different and you’re all traveling on a range of budgets. Full disclosure: We walked around and did some shopping, but didn’t eat much here as it was around dinnertime, and we had made reservations at La Giostra! While some of us were exploring the Medici palace and the Duomo’s baptistry, my mother and sisters opted to take a pasta making class. They learned how to roll several different types of pasta with a small group of people during a three-hour session. If you’re looking for a deeper dive into Italian food, three of my friends who traveled to Florence in 2017 also highly recommend this course. Uffizi Gallery – It’s one of my big regrets that we couldn’t fit this in—but our free day in Florence was on a Monday, when the famous Uffizi is closed! This restaurant was a pure delight. We made reservations several weeks in advance, and my husband told the staff we were celebrating a special event (Mother’s Day in Europe!). We were lucky enough to be escorted to a private dining room, complete with antique furniture, a large wooden table, and candle-lit walls. Of the restaurants in Italy that we visited, this was one of the only places that served me a truly excellent cocktail. The Negroni was spot on, and the 10 Euro jug of house wine for the table was an excellent follow up. 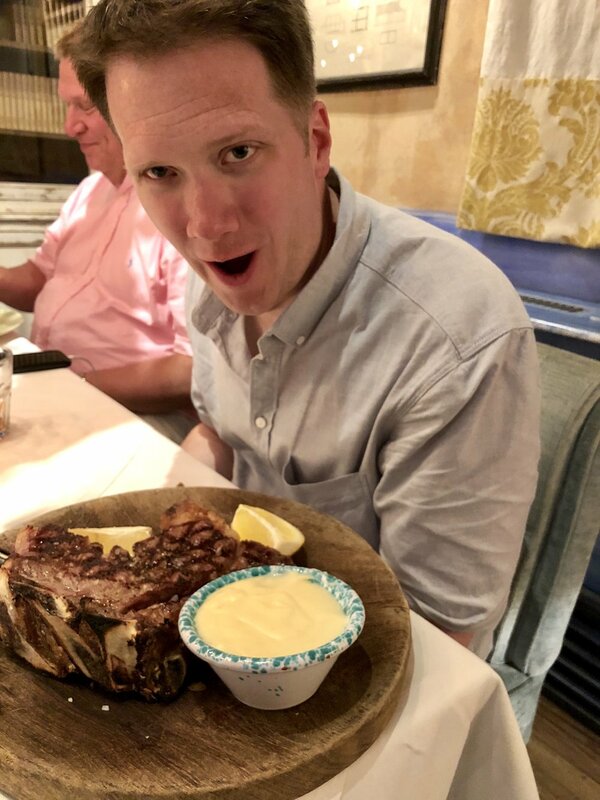 Food highlights included the gorgonzola and truffle gnocchi, the famous Florentine T-bone steak that I split with my husband, and the seafood risotto that my sister wouldn't share. Unsure when we’d get home from a full-day tour in Tuscany, we decided to order in food one night. Family-run Gusta Pizza had been recommended to us by a slew of people—and it didn’t disappoint. We each ordered our own pizza (they’re slightly larger than a personal pizza in the USA) and chowed down on crispy dough loaded with fresh basil, mozzarella, and olive oil. Gusta uses a wood fire stove, which makes each pie slightly different. I remember telling my sister that I “wasn’t very hungry,” and then promptly devoured my whole pizza and all of her leftovers. Tip: Don’t want to wait in line? Order from your hotel or Airbnb with this website. This no-frills sandwich shop is famous for its fresh ingredients and sizable portions. It’s a tasty lunch option that usually has a line—but it moves quickly, and if you visit after 1:30 pm you’ll have missed most of the rush. There are no tables and chairs, so we sat underneath the nearby Uffizi Gallery’s awning. Tip: The Dante sandwich’s truffle cream is fantastic! My husband’s cousin recommended this spot to us, so we made reservations two weeks before our trip. The review? Dad claims his seafood pasta at La Giostra was probably his favorite dish in Italy! Our meal began with a glass of Champagne and a sampling of appetizers, on the house. We then ordered the famous pear ravioli, a creamy plate of burrata, and several other tasty dishes, followed by the tiramisu. Sips of limoncello were served with our check. 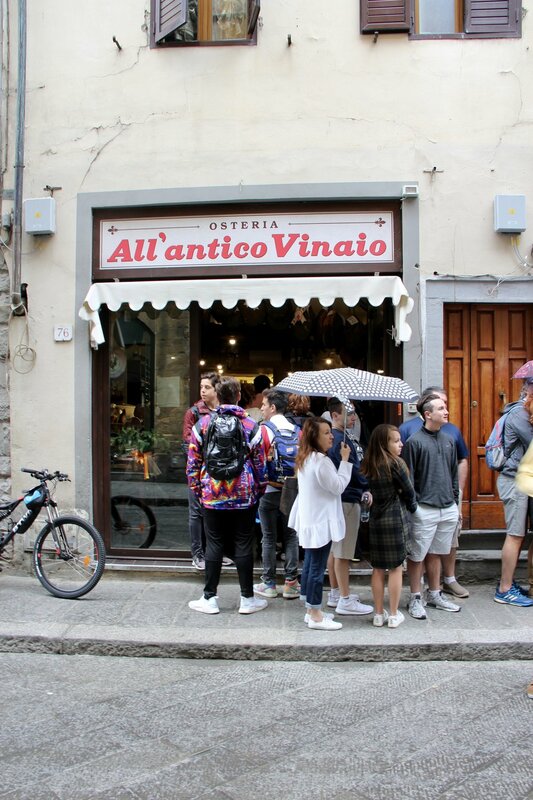 This experience was one of our pricier meals—but the service, samples, and Tuscan-inspired food made it well worth the extra Euros. One of the tasty pear and gorganzolla dishes at La Giostra. If you're moving around town all day, consider getting a portable battery for your phone. Traveling alone? Here's a great high-speed option for less than $20. If you're visiting as a couple or with a group, we enjoyed using this external battery pack—it has two charging ports! The Firenze Card didn't work for us because we were only going to be in Florence proper for two days. But if you're visiting multiple museums, it may be a good option for you! The three-day pass lets you skip lines to many of the top tourists attractions—however, you'd have to go to quite a few museums for the card to pay for itself. If you're near the Duomo and looking for a sweet treat, we loved the gelato at Edoardo. They had both basic flavors and bizarre ones—like toasted sesame! Taking cabs? Unlike in NYC, you can't just stick your hand up in the air to hail a cab. Instead you should look for taxi stands. Some locations to find a cab are shown in the map below; use the button in the top left to see the full list. She looked at me with a strained smile and latched her hands onto the walls around her. We were in a dark circular stairway, narrow enough for only one person to pass at a time. My family was climbing the 463 steps of the Florence Duomo, an iconic pink and green cathedral in the city’s center. 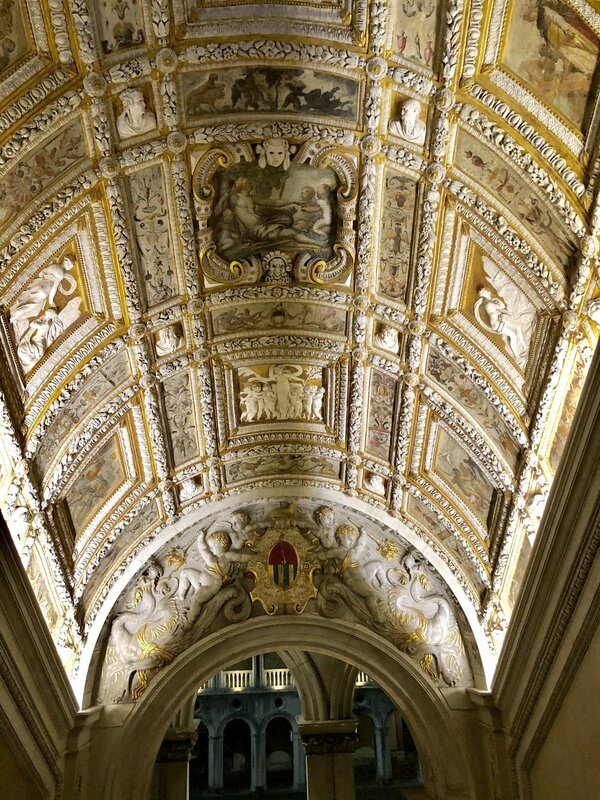 The old stone hallways surrounding us were constructed in the 1400s, and the prominent dome (pictured below) was designed by one of the “fathers of the Renaissance,” Filippo Brunelleschi. The tip-top of the dome was our destination. Part one of our climb was relatively easy. Space was tight, but the line was moving quickly. I ran my fingers over smooth, worn stone and thought of the people who had walked through this building over the centuries. Which clergymen had access to these stairs? Could the public of Florence visit the top of the dome in the 1700s—or even in the 1970s? My mother doesn’t like small spaces that have minimal exits; she likes a getaway plan, and I don’t blame her. This tiny passageway wasn’t ideal for her anxieties, but she pressed on. We all wanted to see 360-degree views of Florence from one of the tallest buildings in town. My sister Kathryn snapped this photo—do you see the fear in our faces yet? My family had now reached the second part of our climb: we walked through a door and onto a 3-foot wide ledge, lining the inside of the dome. The ledge sits 130+ feet in the air and has a plexiglass wall, giving visitors a chance to admire the cathedral below and a ceiling of frescoes depicting the Last Judgement, above. The paintings were so close, you could almost touch them. However, I can’t say that I truly got a chance to study these works of art. I wouldn’t consider myself terrified of heights—I stand on roofs, hike up hills, and love a good Empire State Building view. But something about that 3-foot ledge constructed in the 1400s made me squirm. Why had it not already broken away and fallen to the ground!? As we walked onto the ledge, my mother said, “I thought the top would be more open than this,” in a nervous voice. “We’re not at the top yet, Mom” I replied, trying not to look green. I swiveled my head around. Was anyone else in full panic mood? No, no… all seemed calm. And then I saw my sister, Grace. “Keep moving, people!” she shouted to a crowd of tourists snapping photos of frescoes. She power walked, not glancing at the cathedral below or the works of art above. I giggled as she practically pushed the woman in front of her through the next door, away from the plexiglass ledge. I had a momentary flashback of her panic attack in Scotland when I’d made her climb a steep hill in the rain. Poor sister. Would she ever travel with me again? The ledge, the plexiglass, the frescoes, and Ryan's head. Part three of the climb consisted of more circular stairs up, up, up to the top. But the line wasn’t moving very quickly, and suddenly the small stairway high in the sky seemed like a stone prison to at least half of our group. Dad’s knee was bothering him, Mom was closing her eyes, and my sisters were glancing worriedly at our parents. Even my husband and brother-in-law looked ill at ease. The Fitzgeralds (in particular, Mom) get chatty when we’re nervous, so we began joking with the British tourists in front of us. A few silent moments went by. “You’re wicked for making me do this,” the Brit’s wife said. We were still standing in the same spot of the narrow stairwell. He turned to me. “Now, look! Your family’s given my wife the anxiety.” We all laughed—and after what felt like 20 minutes but was probably 5— the line began to move once more. 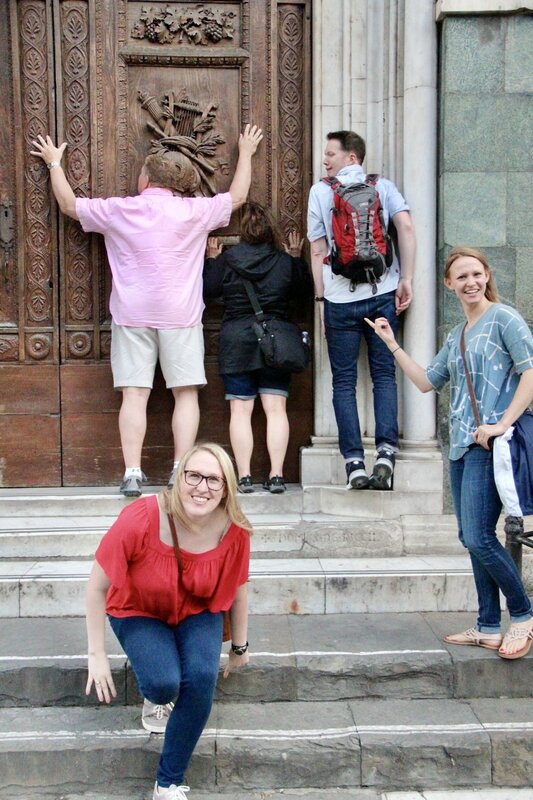 And then, right at the breaking point—when I truly didn’t know if my family or the British couple were going to make it—we crawled through a portal onto the roof of the iconic Duomo. And what a sight we saw. On the hill is Piazzale Michelangelo, a great place to get a view of Florence. See those stairs near the parking lot in the center? We grabbed a beer and sat there post-Duomo climb. The Duomo's bell tower, officially called Giotto's Campanile—which you can also climb. You must reserve a ticket in advance to go to the top of the Duomo. We purchased 18 Euro 72-hour pass so we could come back and see the Baptistry, and booked a 10:30am time slot for the climb. Click here for tickets. Consider your tolerance for tight spaces and heights. My mom made it, so you probably will too! But if you have an extreme phobia, this adventure may not be your cup of tea. Do not wait in the ticket line when you arrive at the Duomo if you have already purchased passes online. The entrance for climbing the Dome is via the Porta della Mandorla (north side of the cathedral). Welcome to Part 1 of our digital journey through Italy! 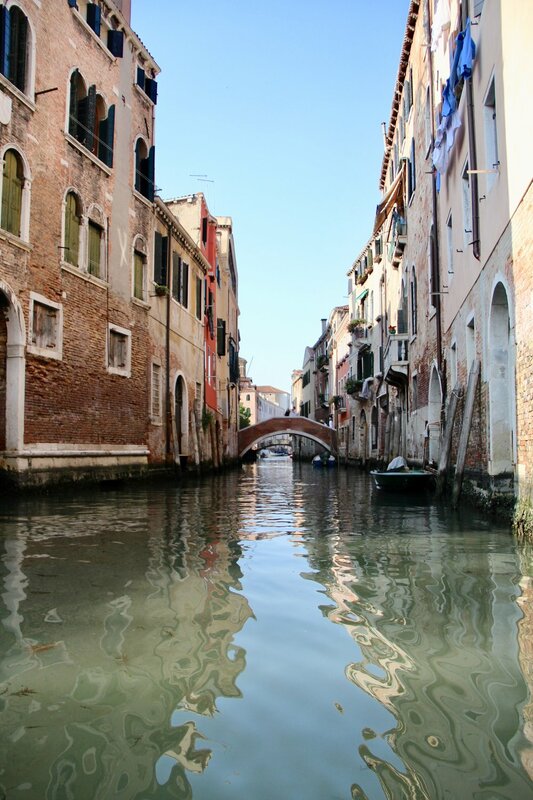 This post will focus on our overall itinerary and stay in Venice. 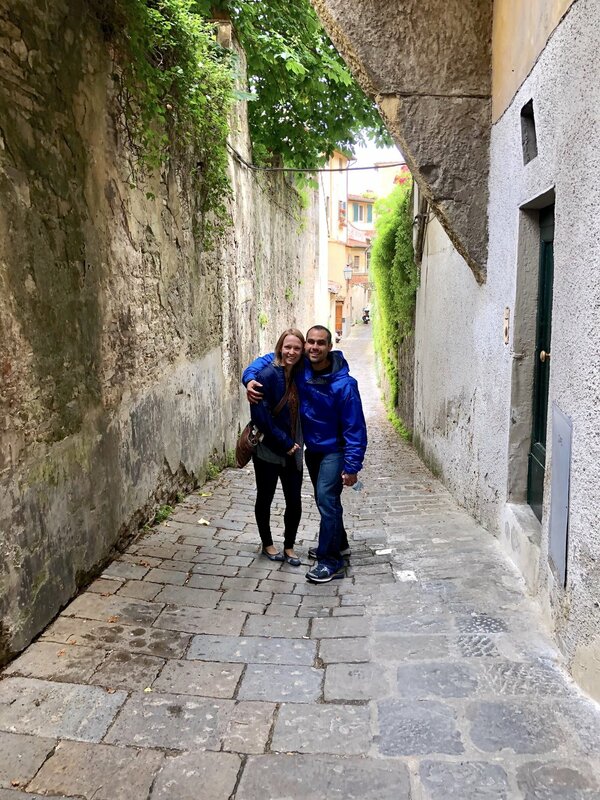 If you’re planning your own trip, be sure to check out my family’s , Duomo experience, Florence tips, and Cinque Terre post. A guide for Tuscany and Rome will be published soon. My sisters and I have traveled to Europe several times, both for adventure and for work. In 2009, I interned at a local newspaper in Ireland for credit during a summer in college—and after that? Hopping on an eight-hour flight and crossing the vast Atlantic Ocean didn’t seem so daunting. Our parents are a different story: they didn’t grow up in a community where a quick trip to Spain was the norm. They got jobs, had babies, and remained happily vacationing in the USA. But last year, they expressed interest in a family trip abroad—and Italy was their dream destination! Never been to the land of wine and pasta? Here’s our nine-day itinerary (created in May 2018), with a focus on the big hits: Venice, Florence, Tuscany, Cinque Terre, and Rome. This post will center around Venice—stay tuned for more! Traveling as a group of seven meant some extra planning was required. We made dinner reservations two or three weeks in advance, booked Airbnbs several months ahead of our trip, and requested two private tours about five months out. We also bought train tickets and museum entrance passes a month before our adventure. Italy is one of the more tourist-heavy countries I’ve traveled through (similar to my home in NYC! ), so extra planning only means less time standing in line. I also used several travel blogs and a Lonely Planet guide book for recommendations. The Rialto Bridge, as seen from our gondola on the Grand Canal. This little town on the water surprised us. My husband and I weren’t prepared to enjoy Venice as much as we did, based off recommendations and travel guides. But despite the slight Disney World feel around the Rialto Bridge, my family was glad to see the colorful canals of Venice—before they crumble into the sea! Grabbing a spritz in the quieter neighborhoods and strolling through Doge’s Palace afterhours were both highlights of our trip. Acqua alta, which translates to “high water,” can be common in Venice—particularly in November and December. Sometimes the flooding only last for a few hours. You can check if the canals are spilling onto the sidewalks with the city’s official acqua alta forecast website. And if they are? Pack some rain boots! Hunter won’t fail you, and Sam Edleman has travel-chic options. We opted for an Airbnb on the cusp of the Cannaregio and Castello neighborhoods, near the Ospedale (in English, “hospital”) water bus stop. This was one of our favorite Airbnbs throughout the trip. The AC and Wi-Fi worked well, and the outdoor roof decks provided a perfect place for my family to rest with a bottle of wine. They also let us leave our luggage in the downstairs foyer after checkout, which allowed us to explore sans suitcases. 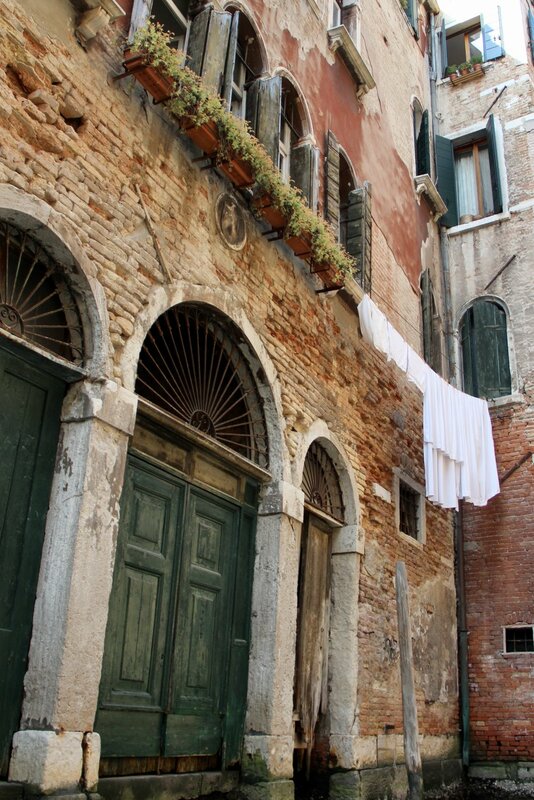 Tip: If you’re hoping to stay in iconic Venice, don’t book a hotel or Airbnb in Mastre (Venezia Mestre). This is the mainland part of the city, so you would need to hop on a train or bus to access the Venice pictured in this post. That said, cheaper housing options are readily available in the Mastre district. Figure out which is more important to you: the price or the location? We could easily access our apartment from an Alilaguna boat, which is the public airport transportation in Venice. Tickets cost 15 Euro per person one way, and 27 Euro for a roundtrip ticket. Expect to stand in line for 10 – 40 minutes depending on the time of day. You can also hire a private water taxi, but it’s quite a bit more expensive. Rates seem to hover around 107 Euro for four people, plus an additional 10 Euro charge per passenger. You can book these boats once you've landed. If you schedule one through a hotel concierge, be sure to get a quote, as markups can be high. Yes, we took a gondola ride—and we didn’t regret it! Rates are 80 Euro per boat during the day, and each boat fits about 5-6 people. Our party split into two groups and spent less than what an Uber costs from Downtown Brooklyn to JFK Airport. If you can’t find a gondolier on the quieter streets, head to the Grand Canal near the Rialto Bridge. The grand and gothic Palazzo Ducale maintains extended summer hours, so we skipped the line and entered this museum at 10 pm (post-dinner, pre-gelato). We wandered the halls of Venice’s landmark building for an hour with only a handful of other tourists. The palace was built in 1340, and was the residence of the Doge, or elected ruler, of the former Republic of Venice. 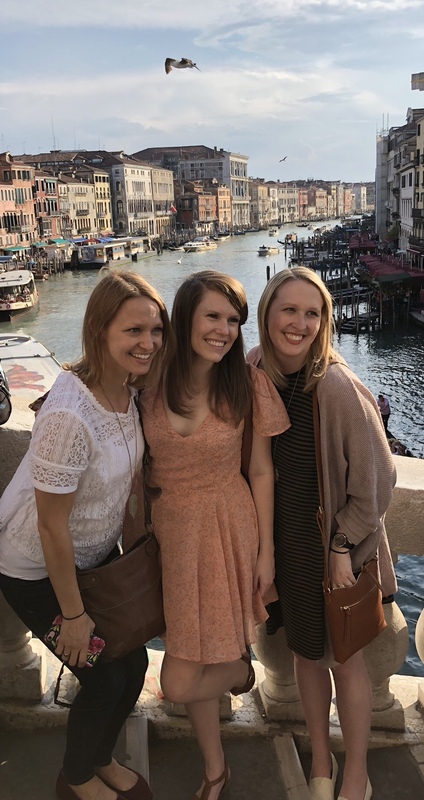 This was a last-minute addition to our itinerary: My husband, my sister, and I ran over to Piazza San Marco early on our final morning in Venice and rode the elevator to the top of the iconic belfry. The views of city's blue-green canals and terracotta skyline were stunning. We waited in line for 30 minutes, hung out in the tower for about 8 minutes, and then rushed back to the Airbnb in order to catch our vaporetto (water bus) to the train station. Spoiler alert: we made it. And tip: Skip-the-line tickets are available if you plan in advance—whoops! I landed a day later than the rest of the family, so they explored this one on their own. Everyone seemed to really enjoy the less-trafficked bell tower and its panoramic views of Venice. The church of San Giorgio Maggiore is free to explore, and the trip up to the belfry is 5 Euro. My family used a vaporetto to reach the island where the church and tower are located. Hop over to the island of Murano to see glass blowers at work, or Burano to see where lace is made. Venice is known for the Prosecco-based Aperol spritz, but we ended up sipping on these aperitifs all over Italy! The cicchetti tradition is also popular: cicchetti (pronounced chee-KET-eeh) are small snacks served with your early evening drinks in bàcari (cicchetti bars). My husband and I broke away from the group and strolled over to Osteria Ai Do Pozzi—pictured on the right—for a little happy hour sampling. We found ourselves surrounded by Italians, sipping wine on an outdoor patio in a quiet square. Venice’s calm Castello neighborhood was charming, and this little pub in the center of it was a nice place to rest for an hour before dinner. Breakfast and lunch were typically small affairs—but our family wanted to do dinners right. So we made a reservation at Osteria Oliva Nera, also located in the Castella neighborhood. The owner of the “ristorante” had a fantastic dry wit and served our party delicious dishes of seafood. We also tasted the in-season fried zucchini flowers, which are not to be missed! Before heading over to Doge’s Palace for the rest of our evening, the owner gifted us with boxed samples of olive oil. Download the Vaporetto app to learn more about the water bus system. We did not experience any flooding during our trip, but we did have one rainy day. My top travel umbrellas include this small one (less than 7 inches, includes a case) and this more sturdy one (about 11 inches). If you’re coming from the United States, remember to pack an outlet converter. Here’s the one I use. Simply wander Venice’s small and winding streets at dusk to enjoy the magic of this city.